One thousand, one hundred and eighty- two minus fifty six equals One Thousand, One Hundred and Twenty Six. The fifty six was for college. That's how many weeks I got to spend with my first born. There were times that I hung on to every second, being fully aware that they'd be gone in the blink of an eye. And other times when I just got through the day with no time for sentiment or introspection, taking it all for granted and mistakenly believing that it all would go on & on and things would stay exactly how they were. Alas, either way - more than eleven hundred weeks are gone and another five hundred and twenty to boot. And the fact that I get to spend one ... ONE single week with the awesome woman that is my daughter, has me just as excited as if it were Christmas. 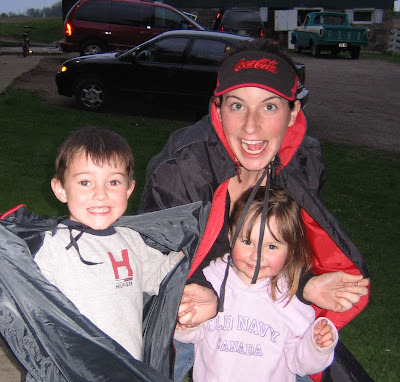 How cool would be to get a whole, uninterupted week with any of ... or EACH of my four wonderful kids?! Literally thousands of weeks spent with that interesting brood and now I'd do a Happy Dance for ONE! A dear friend is coming to house sit while we're at our home by the Sea. Well, actually - 'Abby-sit' - it's her who would be lonely without company. One of my girls asked if she will be 'scared', being out here on the farm. 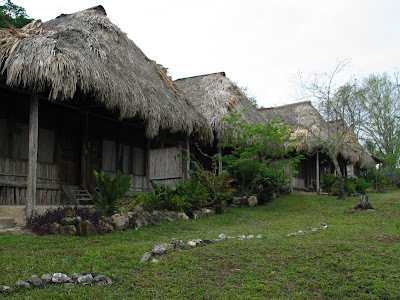 One city friend who stayed here couldn't sleep because of the crickets; another was frightened that the bullfrogs sounded like they were going to attack. The quiet and darkness is also something that doesn't appeal to everyone. I laughed at her question. I seriously doubt if this sweet friend will be intimitated by frogs or crickets or quiet. We went to Guatemala together, on an eye care mission, staying in areas far more remote than this one. We heard louder noises and more intimidating sounds than she could possibly experience here. Like the swarm of Killer Bees that hung ominously in the trees right behind the open dining area, with buzzing so intense that it sounded surreal. But the loudest animal noise that I have ever heard in my entire life was the howler monkeys. We didn't know what they were the first night. It sounded like a cross between a lion and revved up transport truck - right under our window. Were we frightened? Not a bit ... we were totally fascinated. In fact, we got up at 4 am and sat out on the porch of this hut, soaking in the absolutely amazing, incredible experience. So NO, I doubt that a few crickets and some grumbly old frogs are going to trouble her one little bit. I love animals and I love to 'love' them, so it's a slight irritation to me that we have a semi-feral cat who is quite willing to accept our food but not our affection. I say 'semi' because she rarely moves three feet from the back door - she lays there like she's actually part of the family. She runs after me with the food, but if I try to touch her, she's off like a shot. For YEARS now - you'd think she'd eventually start to relax and accept that no there's no threat. The fact of the matter is that she's an imposter. Simon had a kitten, that we named Hank, who we couldn't catch, so we weren't able to take it to its new home until it was a teenager. A week later it came back. Took awhile to catch it again & we took it to another home - a wonderful dairy farm more than 5 miles away. She came home again & started nursing from Simon even though she was just as big. Brian mentioned to the farmer that the cat had come back again. He said 'No, I saw that cat this morning.' So the Hank at our house was an imposter - we named her FRANK - for Faker-Hank. We did try to take her to another home again, but back she came, although we don't know why as she doesn't even like us. It's not that we would mind Frank hanging around, but she's a loose woman and every year, there we are with yet another litter of kittens that we have to find homes for. She keeps away from us until they're suspicious and hissy - which makes them harder to catch, so they wind up barn cats somewhere, which is disappointing for me as I'd rather see them be part of a loving family. She has the most consistently common set of children - can't-tell-one-from-the other black kittens with not a lot of appeal, being both unfriendly and non-descript. On Sunday she moved her kittens up to live under the porch - her usual drill when she thinks it's time for us to provide the milk supply. Brian had thought that she only had one single black kitten & that was good news. We stood quietly and watch another come out, then another & another & another & another. Four of the same old hissy black cats... here we go again. And then suddenly ... there was this little fellow! The most beautifully marked, gorgeous kitten with remarkable blue eyes. She let me pick her up immediately, cuddled in, then purred when I gave her milk. She has a loving home already - the first person who saw her scooped her up. I'm so happy that she will have a loving home as she is going to be an exceptionally lovely cat. Even for someone who has no great affinity for house cleaning in general, there is something wonderfully refreshing and totally fulfilling, to open all the windows and make everything look, feel and smell wonderfully fresh. 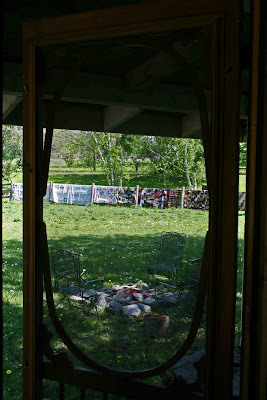 I especially look forward to my first trip over to my Little Cabin in the field, to make that magic happen. When I open the door for the first time of the season, I feel like I'm being welcomed by an old friend who I've greatly missed. An old friend who will feel restored with a little love and attention. Cleaning isn't a chore over there - it's a labour of love. It also helps that I can do it once in the season and basically it stays that way right up until the fall. Nothing gets out of place, there's nothing really to get messed up. In its simplicity, it's my sanctuary - a shelter for the spirit. Readying it for the season is very much a ritual that I enjoy, savour and celebrate. This weekend was perfect for my joyful task. I scrubbed the floor and cleaned the windows and washed all the oil lamps and their chimneys. 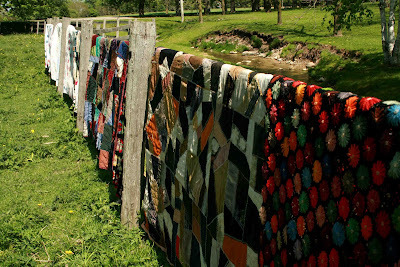 And as always, I carted out all the old quilts and afghans and hung them on the fence to air out. I was fortunate this year - the donkeys were busy in another field. Many years, they have been drawn to the spectacle with great fascination. I have 'chew marks' and grass stains on the corners of some of them, as a little souvenir of their attraction. 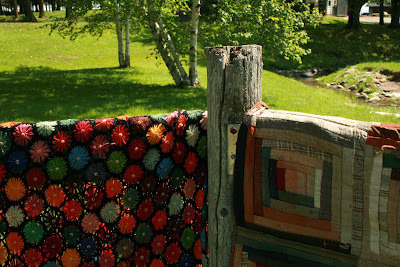 When I was done, I sat in the rocking chair and savoured the fruits of my labour. And then, as always, the bed beckoned me and I obliged. There seems to be a magnet beneath it, that calls me and draws me down into the deepest, most wonderfully restorative sleep. Abby usually dozes on the porch and doesn't come in, although she's welcome to. Today, she came inside and napped with me, seemingly pleased as well, that the task is done and we have begun another season of peacefulness and serenity at our humble little refuge. Yesterday, when I went to stick some stuff in the old washing machine on the porch of my cabin, I was startled to find that someone had made it their home, turning my storage container into a big bird house. I was startled, but delighted. It's hard to imagine that a bird, who was out shopping for some real estate, would discover that tiny little hole & even think about popping in there to have a look-see. Like really ... who would do that? My guess is, most likely a Starling. Brian tells me that they're 'lazy' birds - I prefer to think of them as creative or innovative. That is IF they're buidling their own structures - if they're moving into someone else's space, that is NOT cool. I haven't had a Washing Machine Dweller before, so they were most welcome to this space. As far as I'm concerned, any bird is MOST welcome to nest anywhere here. My Mother, on the other hand, was Anti-Starling. When they built a nest in the mailbox, she'd say "Damn Starlings!" and pull it out. I was horrified. I'd insist that Starlings were birds too & we should be happy about it. I just couldn't understand how this woman, who would help me save every stray or sickly creature that I dragged home, could be not share my excitement that we'd have baby birds. If I were to find a bird's nest there, I would gently push it back further so the mailman didn't disturb it & then try to beat her out to the mailbox every day so she wouldn't discover it. I've been watching for the Mom of these little guys - but I haven't seen who it is. I'm happy that she found a safe place to raise her young-uns and I think that she is wonderfully resourceful. However, I do wonder how she's going to get them out of there though - it might be hard to fly 'up' that hole. I hope she's given some thought to that! In my 'outdoor life', I am mostly surrounded by GREEN. 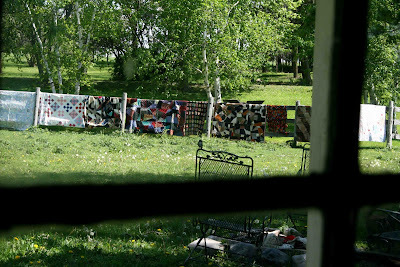 Our barn is green, the shop is green, my cabin is green, we have dozens of various shades of green trees - all on a sea of 70 acres of Green, Green, Green. Not that I don't like GREEN, but I have been hungry for Colour for our entire 21 years on this farm. OUTDOOR COLOUR that is ... heaven knows that I've got oodles & oodles of colourful Characters that fill my life inside my house and inside my head. I have attempt to colour my outdoor world, time and time again - always to be sabotaged by the menagerie of critters that we've shared our space with. Rabbits & chickens & geese & ducks & goats ... ESPECIALLY the goats, believed that any colour that I added to the property was entirely for their palates, not my eyeballs. And then throw in a dozen or more black walnut trees who like to ensure that they and their nuts are the King of the forest & the lawn & the flower beds ... no colour for me. For years, I have hungered for colour to the point of covetting my neighbours beds. Flower beds. I gaze longingly into my goatless, rabbitless, walnut-less, wonderfully colourful neighbour's properties , imagining how delicious it would be to go to the garden and pick a beautiful, bountiful bouquet of ... anything. Sure, I've had pots of stuff, but any given night, I'd forget to hang them all on the clothesline & by morning I'd have only a pot of sad stems... which by the way, do NOT recover - apparently goat lips are a tad too aggressive to be an appropriate pruner. I especially have desperately wanted a splash of colour in the springtime - a balm for the soul after the long, stark winter. The animals technically aren't the problem there - it's the fact that I am so busy every fall, that I completely forget to plant bulbs. It doesn't cross my mind til spring, when I swear that I will, ABSOLUTELY will plant bulbs THIS fall. Twenty one years and its never happened.... not once. So you can well imagine my delight this year, to have tulips magically sprout here and there in my would-like-to-be flower beds. I know I'm slipping, I thought - but I really can't recall that I actually did, FINALLY get my act together and plant bulbs last year. I know I've bought bulbs - year after year - but did I actually plant them? If I did ... good for me! But, alas - I think not. Mystery solved ... my dear sweet daughters thought ahead and decided to surprise me - it was THEY who snuck over and buried that little treasure, to delight their colour-starved Mother. I am just tickled pink. And red. And another shade of pink. In fact, I'm SO happy about it that I actually intend to plant a whole bunch myself this fall. IF I remember. At a woodworking class in 1988, I was busy building my first Ark & the instructor asked me what it was. I replied: 'A boat'. He said bluntly: 'It doesn't look like a boat.' Well, I don't discourage easily and I carried on to finish it and gave it to a friend's daughter as a Christmas gift. She was so pleased with it that when we decided to open a retail store, we named it 'Noah's Ark Studio'. 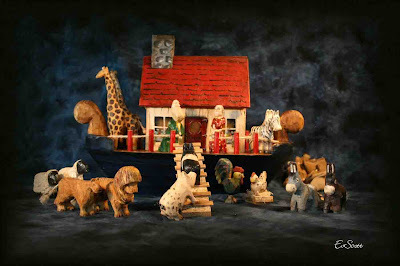 For the next four years, I made numerous Arks, using the wooden carved animals from Kenya. In 1992, I was showing a fellow something that I was impressed with because it was carved & he said 'You could do that'. I'd actually never thought of it even - but of COURSE I could ... I can do anything! The appropriate time to learn seemed to be on a 12 hour trip to Pennsylvannia. My sister, being older, wiser and a nurse, insisted that it was a particularly dumb idea to carve in a moving vehicle. It didn't seem any more of a challenge to me, since I really didn't know what I was doing anyway. With some hunks of wood & a dull xacto knife, I worked my way through some animals. It was the giraffe that did it - one wee tiny spot on his neck ... the knife slipped and sliced my thumb to the bone - a good four inches long. We were on the Thruway, so there was no place to stop to be stitched up. I caught the blood in a grocery bag, glued up my thumb with paper towel & tape and was healed up enough to be back at it on the way home. The scar is my daily reminder that my sister is indeed WISER than me. Pre-internet days, I sold my Arks with the Kenyan animals through mail order in the Country Folk Art and Country Sampler magazines. In the late 90's Shaker Workshops out of Mass. carried one of my little Arks on wheels in their catalogue & I made well over 500 of that style for them. I sold the ones with my own handcarved animals at my store and shows. All in all, there are well over a thousand Edenwood arks spread all over the world - from Tasmania & Australia to Germany & Alaska and pretty well every State in the US and Province in Canada. I haven't had much time to make Arks over the past few years. In fact, I confess that my granddaughter is still awaiting her Ark that was her baptismal gift (she's 5 now) ... and I owe my 11 month old grandbabe one as well. 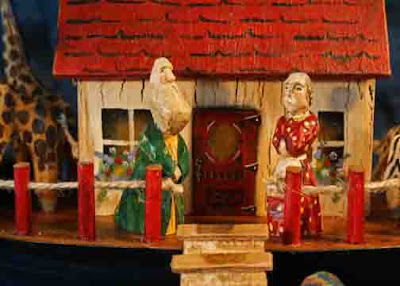 And if the truth's known, Scotty's (also his baptimal gift) never did get the 'boat' part - they call it 'Noah's House' rather than 'Noah's Ark'. Now that I've reached that, I guess the next thing is to get the grandbabes back on the list. I'm thinking of my Mother today, of course. Even though I have been without her longer than I had her, she still very much lives in my heart and in my head. I was thinking about what words of wisdom that she left me with that come to mind immediately. One bit of advice has served me well - the other still makes no sense. The first ... 'WASH YOUR HANDS'. Wise, smart - fine advice. Good Motherhood Creed. The second: 'Don't touch your bellybutton.' She never had a good answer to my 'Why?' - only 'Just DON'T!' I was sure as a child that if I ever did, I'd deflate just like a balloon. It sends shivers up my spine if I ever see someone messing with their bellybutton. I really tried to get past that weird paranoia & not pass it on to the next generation. I don't think that I ever said that to my kids, but who knows - the stuff that our Mother's teach us sometimes gets passed down through osmosis - intentional or not. I'll have to ask them. Today, I'm also thinking about the fact that I have given birth to two Mothers. To see my girls with their own children warms my heart beyond words. They are both such wonderful Mothers - loving & patient & wise & great fun. The next generation is in good hands. My grandbabes have been blessed to have them as Mothers; they have been blessed to get to experience motherhood and I have been richly blessed to get to witness it. Motherhood - where would we be without it. Still plugging away, with every intention of having it on Ebay this Sunday night. 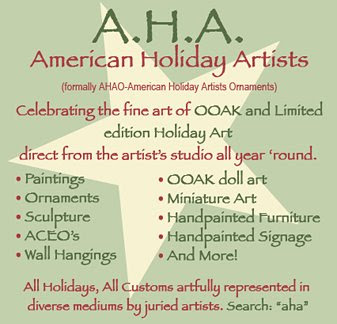 It was a great pleasure, awhile back, to be invited to be a Member of a wonderful on-line Artist's group - 'American Holiday Artists'. There are currently 61 members from all over the USA & a few from Canada, who sell their work through Ebay or Esty. It's been such an inspiration for me ... although, if they weren't such lovely people, I'd be totally intimidated. Every day, someone has something wonderful to offer the world. Sometimes I feel like such a slouch. These folks are consistently producing amazing work, while I diddle daddle around and get one piece up here and there. When we list something on Ebay, we put aHa in the title, so the followers and collectors can see at a glance, all the things that are available from this juried group. It's all Holiday centered, so at this time of year... after Easter & before Christmas, my stuff isn't technically Holiday. But I'm going to have to come up with some way to make it that way, as I love to be able to put aHa after my name. I've never got to have 'letters' before! 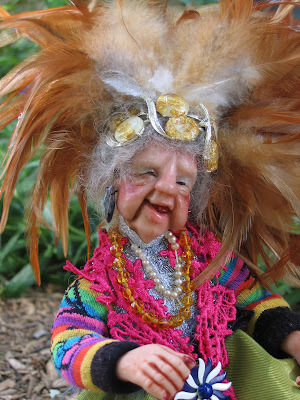 Suzanne Urban, http://suzanneurbandesigns.typepad.com/walnutbeachartist/ a prolific & talented Artist, keeps that blog updated with all the work of the Members. I don't know how she does it, I can't even keep up with this one. She and Sheryl Parsons http://mothersdreamartworks.blogspot.com/ and Susan Vanderhoek, http://seasonalwhimsies.blogspot.com/ of make such effort to promote the group and provide marketing opportunties. American Holiday Artists are at the top of my Blog list, with the various members underneath ... have a visit & you'll see lots of eye candy & be introduced to some awesome & amazing Artists. Oh yeah ... it's been a VERY long time. But I am determined to make some Arks this year - I do enjoy doing them & it's been way too long. So, Sunday night - if all goes as planned, there will be an Ark on Ebay for the very first time. I have never been a fan. A fan of cages, of doing the same thing over & over ... a fan of exercise for the sake of exercise. I love to walk or ride my bike - but the conditions have to be perfect. No wind, the right temperature, nothing else pressing to do. I walk to gawk - to breathe & enjoy nature. I bike so I can listen to my book. So this week, when I signed up at a fitness club for an ENTIRE YEAR, no one was more shocked than me. I've actually gone twice. And had a good time. Really only because (the going AND the having a good time) my youngest daughter is there. All the hamsters with the pained expressions were surely shaking their heads at our attempts to figure out each and every machine. I didn't love the hufffing & puffing & sweating or the confirmation that my fitness level is non-existant, but I love that I'm getting to spend time with her - we actually had fun. And it turns out that there is something there that I actually DO enjoy. A wonderful, big, comfortable massage chair with a pile of magazines beside it. Now THAT'S my kind of equipment.